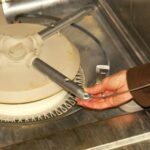 Step-by-step techniques for fixing a dishwasher that leaks. 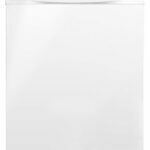 If you have nuisance water leaks around the base of your dishwasher, you may be using a detergent that is sudsing too much. Cut back on the amount of detergent you use and see if that makes a difference. Water that spills through the door vent is usually caused by improperly loaded dishes. Leaks from the door itself may be caused by a faulty door gasket or faulty door tightness adjustment. 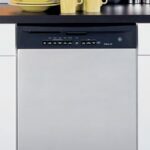 Water under the dishwasher may be originating from a leaky hose or loose hose connection. Remove the lower front panel and check the hoses. The pump seal may be defective, too; replacing this is a job for a repair person. An older dishwasher may have become corroded at the bottom, but this is fairly uncommon. However, if this is the case with your dishwasher, it’s definitely time to invest in a new one.